The communists tried to encourage the Lao people to create a basis to fight their leaders. They must help and stay close to those Lao leaders they have picked that held grudges against their own leaders. The hand-picked individuals became permanent members of the central Lao communist party and were taught how to fight and to conduct themselves as true communists when taking actions. For example, good candidates included those who were mad because their sisters, brothers, parents, sons or relatives got killed or detained by their enemy; and those who were in difficulty but were very ambitious. Those folks were easy to approach and infiltrate, because they believed in the ads and took the call for struggle very seriously. The messages were also delivered to the rural population who lacked contacts with the government. This was done by dispatching teams of data gatherers to the field to collect information, stay close to the local residents and talk to them or pay them to do things that were not allowed by the government. Being on the opposition’s side, the communists provided weapons for the fight. When the fight started, damages started piling up and created more intense hate within the community. At that point, the communists sent in supporting troops and took over as planned. 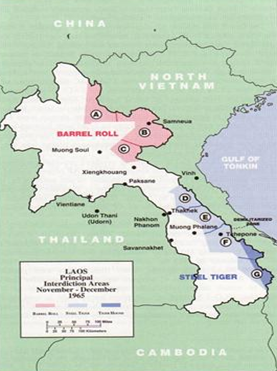 The cease-fire negotiations that took place on January 27, 1973 in Paris between the US and North-Vietnam took place without the attendance of Laos, North-Vietnam’s collaborator. The Lao communists didn’t have the right to attend, and had to wait for instructions from North-Vietnam and for that country to share some of its benefits. However, with North-Vietnam’s victory, the benefit that Lao communists got this time was only an opportunity to deliver their country on a golden plate to their superiors, in accordance with the plan laid out by Ho Chi Minh, the founder of the Indochina Communist Party. This was some form of debt repayment for the blood of North-Vietnamese soldiers who died in Laos while fighting for the red Laos. North-Vietnam then violated the July 20, 1954 and July 23, 1962 cease-fire agreements that prohibited foreign troops from interfering in the internal affairs of neutral Laos. North-Vietnam invaded Laos openly without any fear of and any concern for the rest of the world. [Please read the plan to dissolve the Vientiane faction by the Lao communists, the close first-hand servants of North-Vietnam. This plan created dissension within the Lao community; it formed the basis for the North-Vietnamese to take over Laos as its neo-colony]. Prince Souvanna Phouma was like a soccer player who abandoned his original team and joined a new one. But he didn’t know the game plan of the new team. He just thought that, as a royal prince, he could do anything he wanted. This was an out-of-date thinking, because the world has evolved and is now under two political regimes: democratic regime and communist regime. Lao communists were going after the princes and the kings. They didn’t like the old Laos’ three elephant head flag that stood for the three Lao princes, and replaced it with a red flag with hammer crossed with a sickle –the current Laos’ flag. Photo #144. The flag of the Laos PDR shown next to the flag of the Indochina Communist Party. The Laos’ flag with a “Ka Deuane” (moon) logowas first introduced on December 2, 1975. Once Prince Souvanna Phouma decided to join hands with the communists, he lost all credit and meanings, and just became a tool that served the communists’ policy and interests. An old Lao proverb used to say, “United we survive, parting ways we die.” This was really true. Prince Souvanna Phouma pulled himself away from the Vientiane faction to rally with Lao leaders who were closely knitted with communist North-Vietnam –Kaysone Phomvihane, Kham-Ouan Boupha and Phoumi Vongvichit, the keys that allowed communism to open the door to Laos. The most glaring evidence applied to Tiao Souvanna Phouma and Tiao Souphanouvong, two princely brothers with high education from France, definitely classified among the Lao elite, who initiated the fight to recover independence from France. After their deaths, none of them got any single statue cast and shown in a public place to memorize their role in Laos’ history. Only statues of Kaysone Phomvihane, the “born in North-Vietnam and grown in Laos” leader can be seen today. [According to reliable sources, Kaysone’s father was a Vietnamese whom the French sent to Laos as a teacher; he brought his son Kaysone with him]. This was because the Indochina Communist Party (ICP) said so. ICP ordered that monuments be built to honor Kaysone as a national hero, because he was the one who signed the friendship treaty between communist Vietnam and communist Laos on July 18, 1977 that allowed communist Vietnam to control Laos for 25 years (until 2002) with unlimited 10-year extensions after that. Gen. Kham-Ouan might have been a victim of North-Vietnam’s tactics based on his tricky plan to attract high-ranking Lao officials away from their jobs and get them executed at the Vieng Xay re-education camp. The same plan also pushed a lot of people to immigrate overseas. Gen. Kham-Ouan was worried when he saw people become poorer and deprived of leaders, education, skill, and expertise to the point that the whole country of Laos is now rated one of the poorest countries in the world. Furthermore, Laos is now also a Vietnam’s follower, and is allowing a lot of Vietnamese in. With no work to do, Lao natives have to look for jobs, sell their bodies abroad, and get married with Vietnamese and citizens from neighboring countries in order to survive. As more and more Lao people immigrate overseas, more and more Vietnamese are coming in to occupy lands for free (or buy them at very low costs). Foreign contractors in every field are pouring in to work on our natural resources that will likely entirely evaporate in a not too distant future. In the end of 1981, I had a chance to interview a Lao refugee family who just arrived in the USA. The conversation went as follows. According to the news, many North-Vietnam-instigated measures have taken place, including moving the Vietnam/Laos border line 20 kilometers westward (from the original border line), and multiple development plans involving road construction, lumber cutting, starting new villages, displacing residents to make room for new Vietnamese military bases or new Vietnamese civilian dwellings, prohibiting Lao citizens to walk by the new construction sites, etc. These measures are part of the long-range plan to permanently occupy Laos. As a result, all those children born after the signing of the 25-year Vietnam-Lao friendship treaty by Kaysone Phomvihane will be half-Vietnamese kids who would have been fully trained in communist doctrines and ready to actively administer Laos as a new province of communist Vietnam. Before long, the history, customs, traditions and beliefs of the Lao people would be gone for sure, making the Lao a people without country, subject to constant pressure and under the control of the lone communist party. These are the reasons that prompted many Lao citizens to leave their country and test their luck somewhere else in an effort to rebuild a new –albeit highly uncertain– life abroad. Communist Vietnam is in control of all the armed forces, leaving the Laos PDR no armies and no heavy weapons to defend itself, except for local security guards and policemen equipped only with Ak 47 guns with a shooting range of less than 25 yards, and small hand guns. A Lao proverb read, “If you trust the Vietnamese, you will lose your crops.” Souphanouvong and Souvanna Phouma trusted the Vietnamese. Those two Lao leaders disappeared from the scene in 1975. Photo #145. 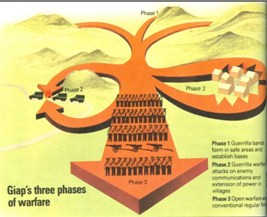 North-Vietnam’s plan and tactics was to invade Laos in three phases, including (1) controlling mountainous and rural areas and population, (2) taking over villages and roads and creating disturbances, and (3) using invading military forces to reap victory and setting up permanent bases in Laos. Map #146. This map shows how communist Vietnam is implementing their assimilation plan. Red zones have been fully assimilated, dark blue zones are being equipped with permanent constructions, and white zones are military bases and living areas of communist Vietnamese. The Lao people are not allowed in any of those areas since 1965. The agreement signed between the US and North-Vietnam in Paris on 27 January 1973 allowed North-Vietnam to redeploy its army and regain control over Laos, Cambodia and South-Vietnam very easily. In mid-1974, Cambodia fell completely under the North-Vietnam’s control. In February 1975, the US and South-Vietnam forces fled South-Vietnam in disarray. In May 1975, Laos also fell completely under the control of the Lao and North-Vietnamese communists. 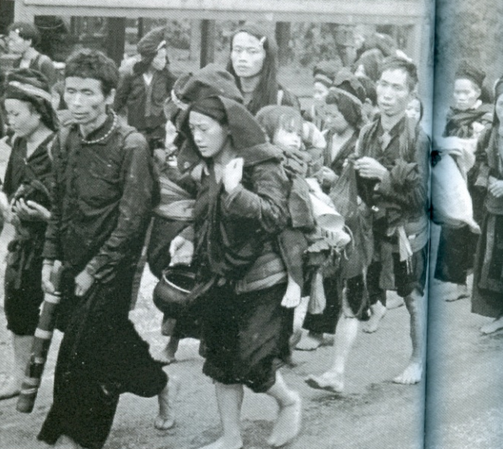 Hundreds of thousands of Lao left their country or were sent to the re-education camp of Vieng Xay in Houaphan Province. The MR-II troops were flown to Oudone, Thailand, with the last flight ending on May 14, 1975 at around 11 a.m. In the Paris Agreement, the two Lao factions agreed to delineate their respective territories, but the Lao communists used the Agreement as a mechanism to attack the rightist Lao troops who had no means to defend themselves since the US had already withdrawn their troops. North-Vietnam also took advantage of the situation and deployed their armed forces equipped with all kinds of weapons from the Plain of Jars to the Sala Phou Khoune’s steel bridge, to Nam Link, to Hine Heup, to That Lath and then back to MR-II through Na Sou and Ban Sone to cut the support line of the MR-II troops stationed in Long Cheng. In the north, the enemy moved its troops from Ban Na to Phou Louang Matt and then to Sam Thong and Ban Hine Tang, getting ready to attack Long Cheng anytime. They were waiting for the right time to catch all the fish in the same net, and tried to avoid sending out an early wrong signal that would give people an excuse to run away. At that time, Sisouk Nachampasak was still officially Laos’ Minister of Defense. Had any fighting occur, the communist side would have been blamed by the whole free world for violating the signed agreement. The Lao communists were the ones with an edge, because they had several divisions of North-Vietnamese troops to support them. They could take over anytime they wished; although they felt they needed to use some political tactics to first incite the laymen people, students, and civilian employees to organize public demonstrations. The Vientiane faction had to find a way to cool down those demonstrations. As it turned out, this was instead a better chance for the Lao communists to attack the rightist faction, after accusing them of manslaughter before the International Court of Justice. The communist-backed demonstrations ended up forcing the rightists to decide to leave the country. The Lao communists then rounded up all the Vientiane’s cabinet ministers, army officers, policemen and national employees who could not quite read the communist tactics, and sent them to the re-education camp of Vieng Xay, Houaphan Province. Of the 46,000 or so that were sent to the camp, a large number of detainees died there. In 1979, when China attaked Vietnam, a small group of political detainees were released from Vieng Xay, many of them with health and emotional problems. These events that involved so much hardship inflicted to other human beings was foretold in a prediction made way back in the Buddhist year of 2500, “Ogres will come out and eat the Lao. The lucky ones will survive by seeking shelter under banyan trees.” This means that the survivors were the lucky ones who went abroad and escaped being killed or tortured by the Lao communists. Gen. Vang Pao and many leaders have decided to leave MR-II and the kingdom of Laos. Advantages and disadvantages of such a decision are discussed below. The most obvious advantage was the absence of the bloodshed for both sides that has been avoided, because MR-II and the rest of the kingdom of Laos had already lost a great number of people between 1945 and 1975 due the battles that the communist Vietnamese fought in Laos. In addition to human losses, the abundant natural resources in those areas have also been significantly destroyed more than in any other country in the entire world because of military operations. The following excerpts from Gen. Thonglith Chokbengboun’s speech delivered after his arrival in a foreign country further described the turbulent situation. The primary disadvantage rested with being away from your native country, your relatives and your close friends, all of which created a feeling of deep and unexpected sadness. We immigrants felt homesick; we no longer have a country of our own to speak of, and can no longer practice our customs and speak our traditional language. We have to start everything anew. The older folks are especially disappointed and sad because they are no longer qualified to do their old jobs and have no more opportunities to educate themselves. They felt bad about leaving their country in the exclusive hands of the Lao communist party. This is a party that did not implement the 18-point agreement it has signed with the rightist party; continued to infringe upon the rights of the Lao population of all ethnic groups that still live in Laos, constantly threatening them, creating internal family and community dissentions, looking for opportunities to using them as tools to dismantle the Lao society, and making false charges that are later used as the basis for incriminating individuals suspected of collaborating with the rightist group. Furthermore, the Lao communist party had killed many Lao ethnic people, including the Hmong who went into hiding in the jungle and did not dare to come out and cooperate with the Lao communist party for fear of being killed or sent for an indefinite period to a re-education camp, away from the outside world and their close families. The Lao communist party does not have a religion and does not accept any moral guilt –just power. Their search for the ethnic groups hiding in the jungle was just an excuse; their main objective was to give their agents a chance to pilfer unashamedly everything they could find, e.g., cutting trees, collecting mining products, taking ownerships of productive lands, etc. This was the main reason for the ethnic groups to flee in the jungle or to look for a safe place to live. In 2006, thousands of ethnic highland Hmong fled Laos and headed out to Ban Hoeui Nam Khao with the hope to escape an authoritarian regime backed by the Vietnamese that killed the Lao people and/or forced them to leave for another country. The 5,000 Lao Hmong who left Laos then were forced by the Thai authorities to go back to Laos on December 28, 2009 and resettle at Ban Phone Kham, Borikhamxay Province. Nobody knows about their latest fate. The properties of those refugees, including houses and lands, were all repossessed and retained as public properties. They were not returned to their original owners, who were not given the right to reclaim. Photo #147. The Hmong people were heading to Thailand in 1975, following Gen. Vang Pao’s foot steps. Everybody had to walk on bare foot to maintain silence and to feel safe. Photo #148. 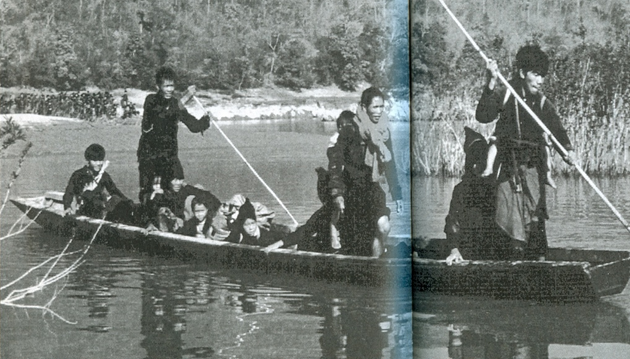 Hmong refugees from MR-II using a small boat to cross the Mekong River at great risk. Many of them got drowned due to accidents of different natures, including boat sinking due to mismaneuvers, unfamiliarity with boat ride, losing equilibrium while standing on a moving boat, getting shot at, running into turbulent eddies, jumping in an overloaded boat, etc. Many people were still waiting for this boat to go back and pick them up.